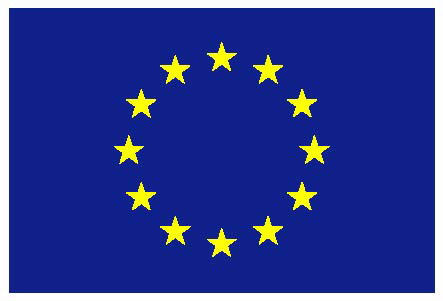 After a very fruitful and creative 3-year period CIPTEC project comes to its end. The last step was the CIPTEC Final Conference “BE CIPTEC! 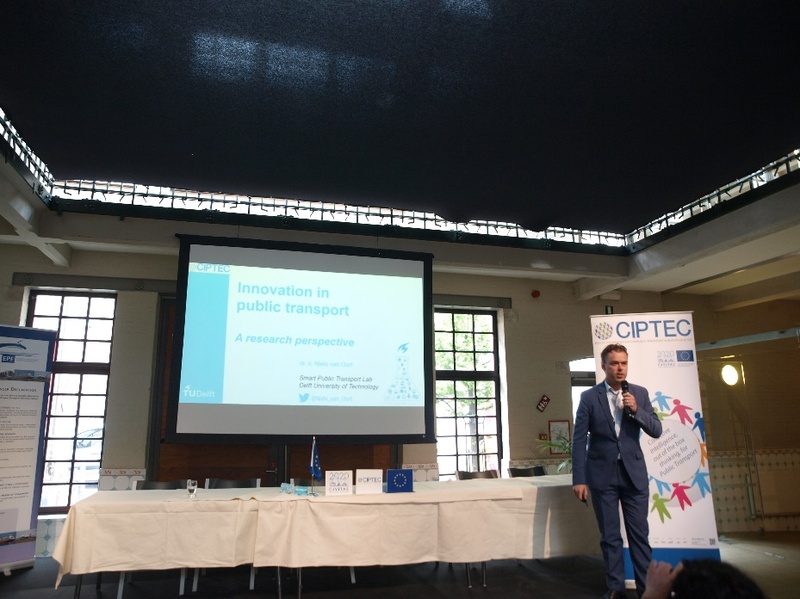 Move public transport forward through innovation” and took place on 24th of April 2018 in Brussels, Belgium. 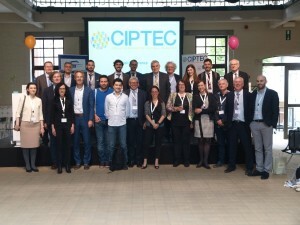 In total, around 70 participants from several European countries attended the Conference and had the opportunity to learn about CIPTEC activities and results. 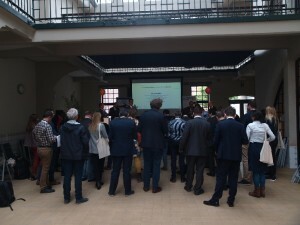 The Conference started at 09:30 with the registration and ended at 16:15 with a networking closing drink session, accompanied with some live band music. Prof. Aristotelis Naniopoulos (CIPTEC coordinator) welcomed the participants and gave an overview of all previous CIPTEC activities, summarising the main findings and insights at the closure of this project. During the interview-style discussion moderated by Mr. Geert Kloppenburg, the leader of each Work Package (WP) gave a brief overview of each WP’s achievements, answering to the questions addressed by the moderator. Giving interactively the “true” story of our work, instead of delivering a predefined speech, attracted participants’ interest. 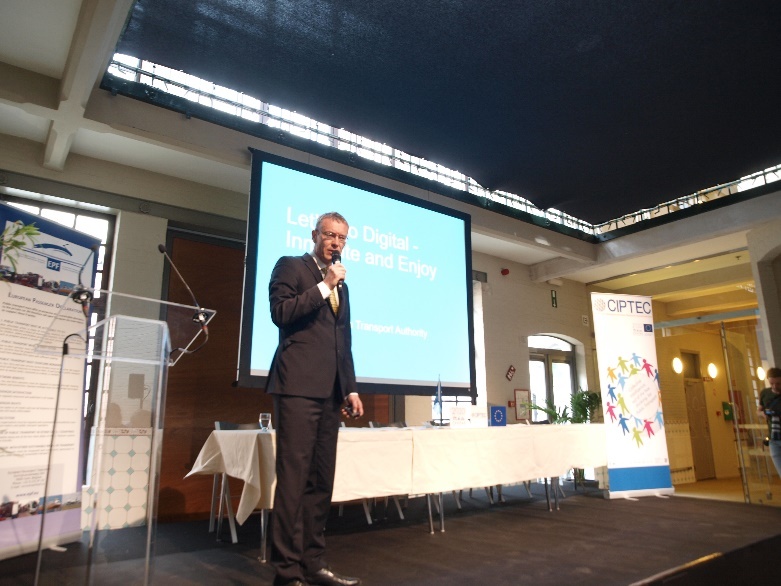 Mr. Antti Vuorela from the Helsinki Region Transport was the 1st invited keynote speaker, who gave the presentation entitled “How to get instant feedback from your customers: Digital Dialogue Helsinki”. Mr. Vuorela focused on the needs of the customers, mentioning several innovative examples of speeding up feedback to end-users or staff, for example by using smartphones, big data and QR codes. The 2nd keynote speaker: Dr. Niels van Oort from TU Delft presented “The opportunities of ICT/IoT applications in Public Transport”. Dr. Niels van Oort stressed that the main stream innovations are in the area of automation, sharification and electrification and data & trends can be used to understand, predict and improve the service quality. 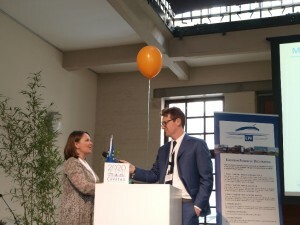 The 3rd keynote speaker: Mrs Isabelle Vandoorne from DG MOVE explained in an interview-style discussion with Mr. Geert Kloppenburg the European Commission’s perspective on innovation in transport. Two interactive sessions ran in parallel in two different rooms and participants were divided in two groups. 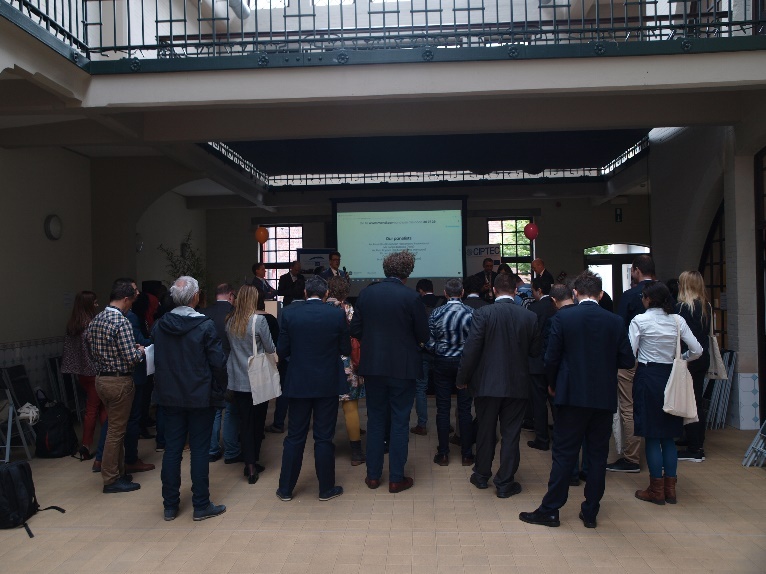 At the one session, the workshop entitled “Collective intelligence-user co-created innovation-methods” and the workshop entitled “Nudging people towards public transport-an experimentally-tested intervention to increase public transport use” took place. During the first workshop, we highlighted how we have involved the end users in the CIPTEC project and which methods we have used. Mrs. Afroditi Stamelou from AUTh delivered an overall presentation regarding CIPTEC experience on collective innovation approaches (co-creation workshops and crowdsourcing campaigns). Next, Mr. Giannis Kostopoulos and Mr. Simone De Ioanna from White Research moderated the discussion among the audience and the CIPTEC partners (in particular, AUTh, Tiemme, MRDH and traffiQ) that implemented collective intelligence initiatives. During the second workshop, Samuel Franssens gave an introductory presentation regarding nudging concept and application examples of it in Public Transport, while Mrs. Willie De Swart from MRDH/RET explained the field experimentation that was realised in Rotterdam. After this presentation, prof. Aristotelis Naniopoulos of AUTh shortly presented the conjoint analysis that revealed hidden consumer segments and their preferences towards innovation, which was conducted in the frame of CIPTEC. 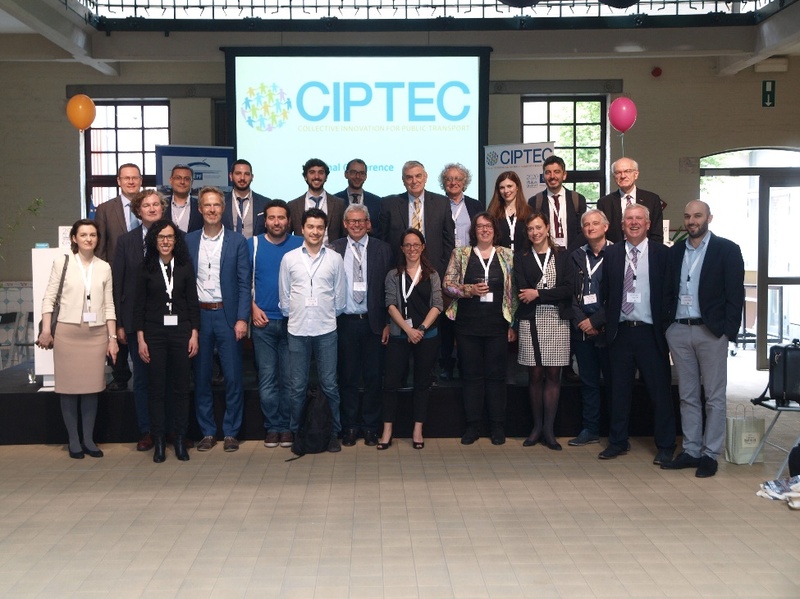 At the parallel session, the workshop entitled “CIPTEC innovation tools-a key to better transport” and the workshop entitled “Breaking down silo thinking by learning from other sectors” took place. During the first workshop, Mr. Ilias Trochidis from Tero presented the Crowdsourcing platform and Mr. Saverio Gini from MemEx demonstrated the CIPTEC digital Toolbox. The participants had the opportunity to go through these tools and explore new solutions that might help them to innovate in their city. Mr. Evangelos Genitsaris from AUTh moderated the interactive session of the workshop with the key participation of Mr. Giorgio Ambrosino and Mr. Johannes Bardong who described their experiences on using both CIPTEC tools on behalf of Tiemme and traffiQ, respectively. The second workshop was moderated by Mr. Otto Cazemier from Mobycon and included a panel discussion on how social innovation has been successful in some areas took place, mentioning among others, some examples of Community Transport Schemes in UK, Ireland, and The Netherlands, as well as examples coming from other sectors. Additionally, during the discussion, Mentimeter allowed delegates to raise comments and suggestions to aid moderator and keep the flow of the discussion interactive. In that way, everyone could see right away what the opinion in the room was on various issues which enriched the discussion. The two Interactive sessions A and B were repeated later on for the participants that had attended sessions B and A, respectively, previously. During the afternoon plenary session, inputs from the interactive sessions were gathered to fuel a wrap-up panel discussion. 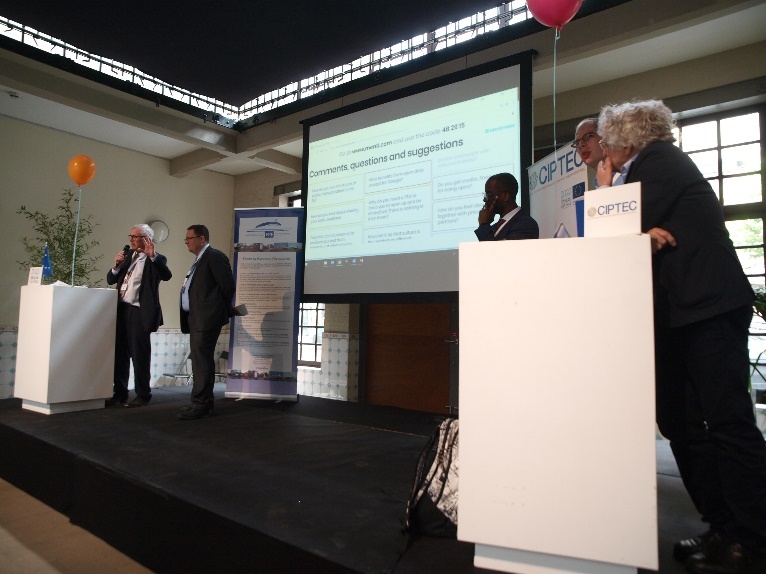 The panel consisted of Dr. Jon Lamonte (Chairman of EMTA, CEO of TfGM), Mr. Freek Bos (from the European Passengers’ Federation), Mr. Piotr Rapacz (from the DG Mobility and Transport), prof. Aristotelis Naniopoulos (from Aristotle University of Thessaloniki, CIPTEC Coordinator), Ms. Luana Bidasca (from Polis), and Dr. Niels Van Oort (from TU Delft). 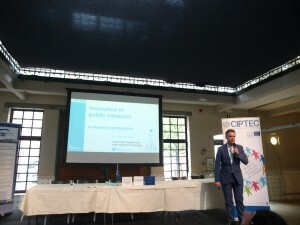 At the end of the Conference, the CIPTEC experience and day’s discussions were used to debate on statements relevant to the development of public transport. During this interactive activity, participants voted how much they agree or disagree with selected positions. The Conference closed with the wish of exploiting CIPTEC outcomes after project’s end in the most effective way in order to make public transport more innovative in European Cities.